My poster for Ben’s talk. 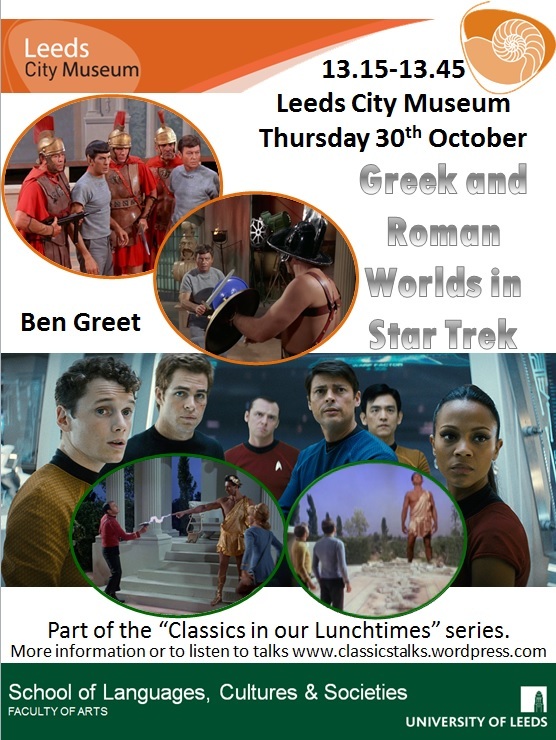 Ben Greet (PhD student, topic: Roman Eagles), considers how the universe of Star Trek depicts close encounters with the classical world, bringing it out of books (whether of history or mythology) and to life for a mass audience on the small screen. Focusing on two episodes from season 2 (1970) of the original Star Trek (“Who Mourns for Adonais”, episode 2, and “Bread and Circuses”, episode 25) that introduce Greek gods and the Roman Empire respectively, Ben’s talk will explore their “authenticity” and significance from a number of different perspectives. The success of these episodes with audiences and the attraction of the frontier of the classical is apparent from episodes from season 3, which add philosophical (“Is there in truth no beauty” and “Plato’s Stepchildren”) and epic literary (“Elaan of Troyas”) episodes to season 2’s mythological and historical encounters.